I'm trying to move SharePoint files within the same site, but between two different document libraries. 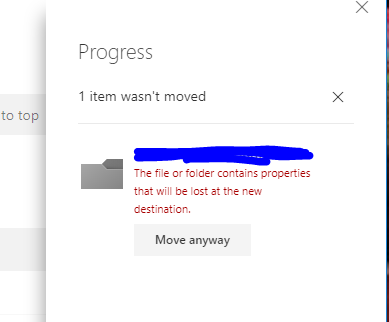 Unfortunately, when I go to move, I keep getting the following error "The file or folder contains properties that will be lost at the new destination." And, the button to "move anyway" shows up. Questions: - What does this error mean? - If I click "move anyway", will links to the documents be broken, or will they remain the same? Thank you! When a file is assigned to a content type, the metadata was linked to the file and not the library. The Content Type must be on the destination Library. You had to first add the Content Type to the new library in order not to lose the metadata. Then you can move your files without getting this warning. Not the answer you're looking for? Browse other questions tagged sharepoint-online error move or ask your own question. How do I move SharePoint Lists and Libraries to another Site Collection?